Share this product and receive a $5.30 sharing discount. 'I am the vine, you are the branches... John 15:5' This beautiful framed pewter cross is an absolute perfect gift for someone very special. This is the work of Cynthia Webb, a San Diego, CA artist who specializes in handcrafted fine pewter ornaments, framed plaques and gifts. Her work is known for its fine detail, which is evident on both the front and back of her pieces. 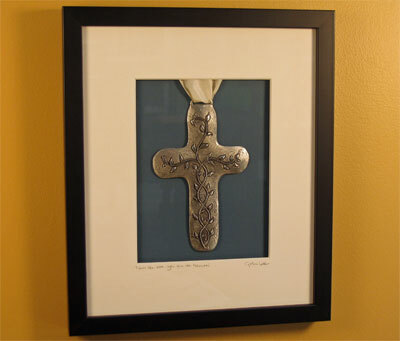 This pewter cross ornament has been framed with an acid free mat, signed and titled by the artist. 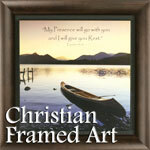 The frame size is 11" x 13". It is ready for hanging. The mat is blue and the frame is black.